Department of Electronics and Communication Engineering, School of Engineering and Technology (SET), is organizing three days workshop on “Practical Aspects of MATLAB” from on 25th -27th March 2019. NOTE: Pls fill the google form shared below. We have only thirty seats. Department of Mathematics, SBSR Organizing Technical Presentation Competition in Mathematics for Post Graduate students | 25th March 2019 @ Mathematics Lab (Room No. 119) Block-1. Department of Mathematics Organizing Technical Presentation Competition in Mathematics for Post Graduate students, 25th March 2019. Introduction: In the introduction, briefly introduce your group, your topic, research question, approach and the structure of the presentation. Presentation with inserted „discussion fields“: The kind of question to ask and approach to employ depends on the topic. Conclusion: The conclusion should briefly summarize the results of your presentation without repeating too much. The main objective is to provide audience with input to a given topic. This input serves as the basis for discussion during the session. For a fruitful discussion, it is not only essential to present the basic concepts and ideas, but also to spark (and preserve/ strengthen) your classmates’ interest in the topic. Date: 25th March, 2019| Time: 09:30 AM -11:30 AM |Venue: Mathematics Lab (Room No. 119) Block-1. World Tuberculosis Day is celebrated every year by the people all across the world at international level on 24th of March. It is celebrated to raise the common public awareness about the epidemic disease of Tuberculosis as well as get their efforts in order to eradicate this disease. To raise the awareness among the people regarding tuberculosis. To enhance their knowledge regarding early detection Tuberculosis by identifying early sign and symptoms. To promote the people for DOTS strategy who already had the Tuberculosis. To enhance the knowledge of the people regarding TB and its prevention by Role Play and exhibition. Department of Respiratory Medicine, School of Medical Sciences & Research and Sharda Hospital is celebrating World Tuberculosis Day on 26th March, 2019 by organizing the following events. Venue: OPD, Department of Respiratory Medicine, Block – C, Ground Floor, Sharda Hospital. Theme: UNITE TO END T.B. School of Humanities and Social Sciences is organizing a Career counselling session for MA & BA final year students at Sharda University, Greater Noida. It will help them in clearing their vision and will inform them about the opportunities they will be having after post-graduation and graduation. Centre for Advanced Research in Applied Mathematics & Physics (CARAMP), School of Basic Sciences and Research, Sharda University is organizing special lecture on “S. Chandeaswkhar: The Joy and Perils of doing Science” By Prof. K. R. Sreenivasan (Ex- Director, ICTP, Italy & Senior Functionary at New York University, USA). Prof. K.R. Sreenivasan is one of the most well-known world scientists in the area of turbulence, intermittency, convection and quantum turbulence. He has received numerous awards and prizes in recognition of his scientific work, mostly in fluid mechanics, nonlinear and statistical physics, and service to scientific community. He is presently University Professor at New York University and also Senior Vice Provost. He has held visiting positions at the Indian Institute of Science, Cal tech, Rockefeller University, and Institute for Advanced Study at Princeton University and, as the Sir C.V. Raman Professor, at the Indian Academy of Sciences. To communicate the important role of S. Chandrasekhar (Nobel Laureate) in the Discovery and spectral classification of 2300 supernovae, identification of an emerging class of ultra-luminous supernovae, insights into the progenitors of type Ia supernovae, discovery of luminous red novae, the most comprehensive UV spectroscopy of Ia supernovae, discovery low energy budget supernovae, clarification of sub-classes of core collapse and thermo – nuclear explosions, mapping of the systematics of core collapse supernovae, detection of gamma-ray bursts entirely via their optical afterglow, identification of a trove of eclipsing binaries (including a planet around a newly born star) and identification of a number of the curious AM CVns. The session is open for all students and faculty members. Department of Mass Communication-SCADMS is organizing a Panel Discussion on ‘Film Making in Short Budget’ presided over by noted Bollywood personalities Zeishan Quadri and Randeep Jha on 25th March, 2019. The expert comments will help students to learn basics of film making and how to make film making as a career. Department of Mass Communication-SCADMS is organizing a Panel Discussion on ‘Film Making in Short Budget’ presided over by noted Bollywood personalities Zeishan Quadri and Randeep Jha on 26th March, 2019. 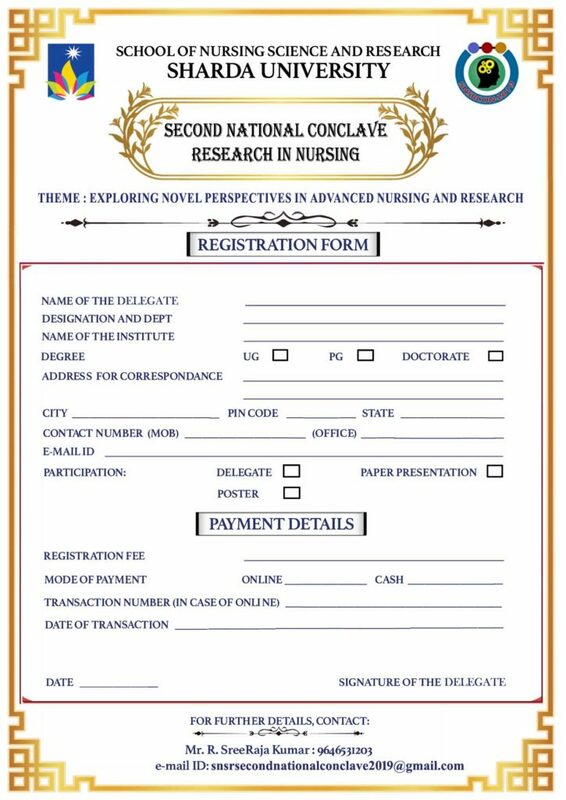 School of Nursing Science and Research (SNSR), Sharda University is organizing SECOND NATIONAL CONCLAVE on ‘ Exploring Novel perspectives in Advanced Nursing and Research” | 27th – 28th March 2019. Nursing research has a tremendous influence on current and future professional nursing practice. Nurses require research because it helps them to advance their field, stay updated and offer quality patient care. Research findings can help nurses to use information more effectively to develop their own conclusions. Evidence-based practice is important for nurses because it is encouraging and supporting nurses to get involved in research to build a solid base of evidence on which to build stronger nursing practices. To empower information regarding creating excellence in care. To enhance knowledge about Meta-analysis and clinical trial. To motivate the participants to engage in advanced nursing research. Dr.Nanjunde Gowda, Principal, Anil Bhagi College Of Nursing, Firozpur, Punjab. School of Dental Sciences is organizing LMS- SESSION 2 – FACULTY DEVELOPMENT PROGRAM on 27th March 2019. HR & OB Department and Career Counseling Cell both of School of Business Studies, Sharda University jointly Organising a Guest Lecture (Invited Talk) to be delivered by Lt. Col. Ajay Chaudhari (Retd. ), Principal Consultant, Adroit Consultants on the topic – “Corporate Readiness for Management Professionals”on 27th March 2019. Equip students with the most important workplace skills such as oral and written communication, critical thinking and problem-solving, etc. Prepare students to meet corporate expectations. School of Humanities and Social Sciences is organizing a Soft Skills Training session for MA & BA final year students at Sharda University, Greater Noida. It will help them to improve their ability to communicate effectively with co-workers, employers, clients and customers etc. To improve the Communication readiness and abilities of the students towards achieving more standardized communication levels. To enhance day to day communication effectiveness. To develop self-confidence and presentation skills. To develop leadership skills to improve teamwork, creativity, efficiency & productivity. As part of the experiential learning Faculty and Law students are participating in the Open House & Panel Discussion on “Graduate Insolvency Programme: Introducing Insolvency to the World of Education” conducted by Indian Institute of Corporate Affairs, Manesar at India International Centre, Lodhi Road, New Delhi. Graduate Insolvency Programme is an industry initiative that aims to offer a two-year-long programme with a focus on insolvency. Recognized by IBBI and offered by IICA, the programme aims to create a top cadre of insolvency professionals in India. The programme will provide a well-rounded exposure into insolvency ecosystem. Mr. Sumant Batra, Honorary Course Director, GIP & International Insolvency Expert. 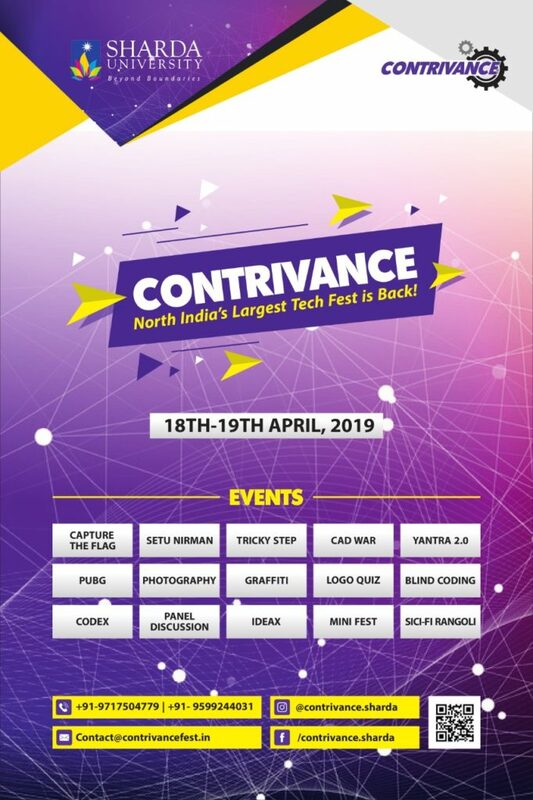 Venue- India International Centre, Lodhi Road, New Delhi.